Back in June, Apple WOW-ed us with its announcement of iOS 8 and OS X Yosemite, two new operating systems to sync and amp up your mobile and desktop devices. Fast forward to today, the official launch day of iOS 8: available NOW for download on your iPhone 4s, iPhone 5/5s, or any iPad created after generation 2. 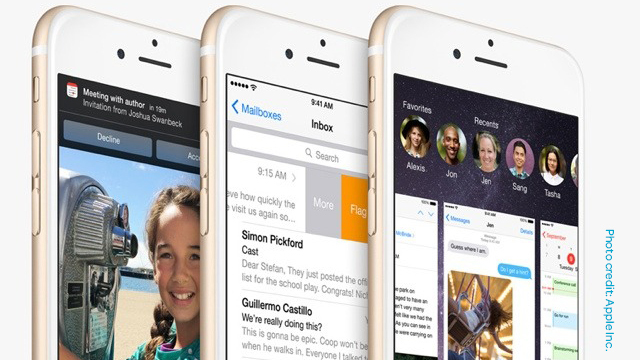 Of course, if you’ve preordered your iPhone 6 or iPhone 6 Plus, you can expect to receive your new devices as early as Friday with iOS 8 installed. Just what can you expect out of Apple’s state-of-the-art new operating system? Time Magazine outlines some of the “bells and whistles” included in iOS 8 ace easier and more shareable photo editing, app sharing between family members, enhanced voice & video messaging, customizable group messaging options, predictable keyboard typing, and of course- Apple’s latest health & fitness app. Need a more visual idea of how these features will change your phone? Check out the slideshow from PC Mag to see which their editors are most excited about. But first and foremost, NBC News warns downloaders to be sure to back up your device via iTunes or your cloud service of choice before beginning the download. Whether you download iOS 8 today or wait for other’s to test out any bugs, there’s plenty to get excited about. Visit our WWDC announcement blog to learn more about the features of iOS 8, and stay tuned to see which of our cases for iPhone 6 and iPhone 6 Plus will best complement your newest, fastest, and favorite device yet.